Oh friends, I’d so hoped to be a regular blogger all summer, emphasis on regular, and I didn’t do so badly there for a week or two. And through the lovely days, things gathered in my head that I wished to tell you, but I didn’t get them spoken after all! Not that this is a tragedy of any proportion whatsoever, not for you or me; there are words enough swimming into everyone’s daily net and the ones that get away are rarely missed! A good thing, that. But such a lovely summer it’s been, the work (of writing) suspended from any kind of disciplined practice for a time in order to catch up on some other things. Ah, yes, catching up. My mother is 91 and in a personal care home, her life now lived in one small room. When I visit and ask what she’s done that day, she may say she’s going through her things – letters, cards, photos – and sometimes she says she wants to get things organized and into albums one of these days. It’s all quite beyond her, given her current limitations: her achievement now lies in re-looking, moving things from one side of the drawer to the other, and gratitude (which she freely expresses). But I recognize the longing to finally have everything in order. The main difference between us, perhaps, is that I know she will never catch up in the way she hopes while I still operate under the expectation that I will, even if I know in the best part of my brain that this is illusion. Still, I did catch up, in a manner of speaking, on our photos this summer. 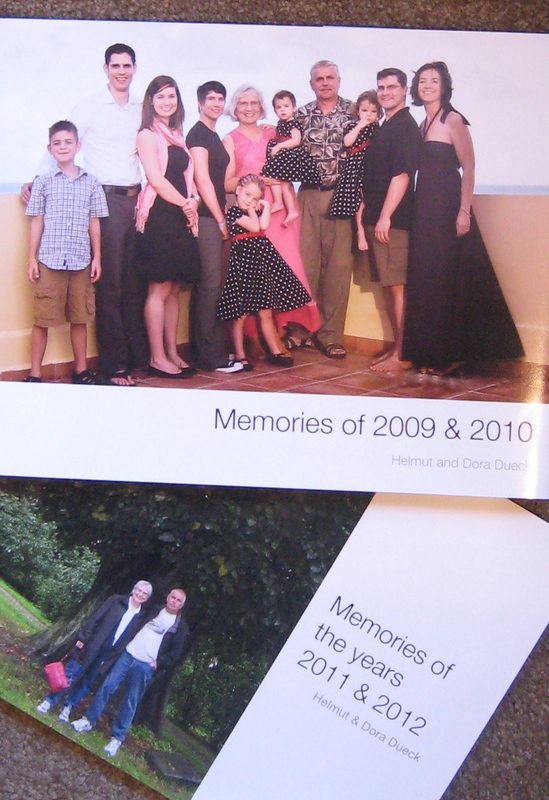 For many years I scrapbooked our family memories – chronologically – but when I checked, I discovered I had last reached the end of 2008. Since that was about the time we stopped developing our photos, I was truly behind. I took a scary (for me) leap from scrapbooking technologies (prints, stickers, colored papers, cropping knife, fancy-edge scissors!) to two photo books created on the computer. I learned something new computer-wise and got caught up to the end of 2012, and, I have to say, I’m feeling mighty proud of myself. This summer too we had the privilege of guests, the most special being H’s brother and wife from Paraguay, in the Winnipeg area for two months, such an easy-to-be with couple, such good times, made more poignant by the fact that at the daily distance we live from H’s family, we never know when or if we’ll meet again. – And we camped. I exulted once earlier about fun with our little bargain camper, but by way of repetition, I was loading foodstuffs into “Winnie” the other day for a weekend at Stephenfield, standing there in our teensy-tiny kitchen/bedroom on wheels, when I realized how happy I was doing exactly that task in that teensy-tiny space. 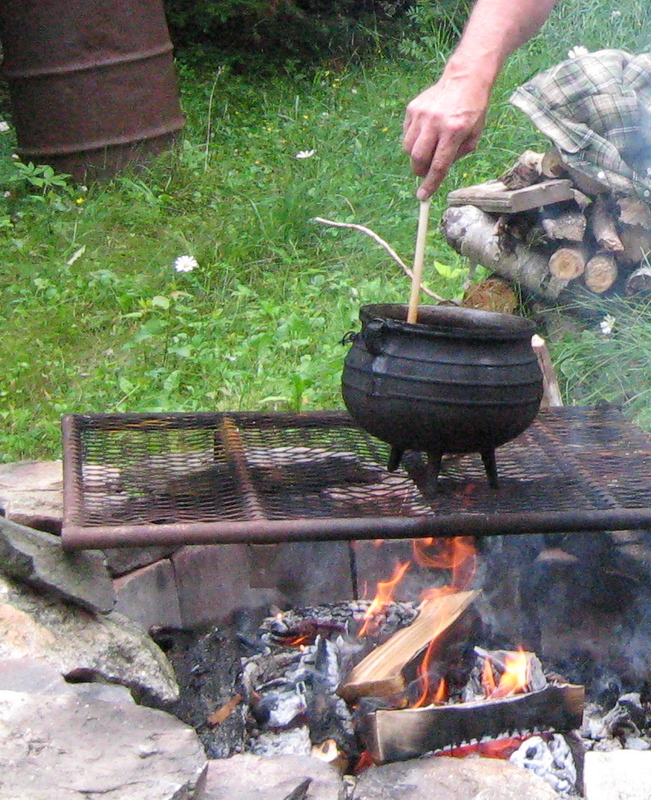 H. teases me that I like camping because he does a lot of the cooking, which is probably true, since he makes a fine breakfast over the Coleman and one fine fire after the other over which he then makes an excellent guiso – stew — in a cast iron pot. But it’s other things as well. Camping, we walk, talk, maybe swim (okay, we’ve braved in, hurried out), maybe invite friends to share an outdoor meal. And there’s lots of time to read, undistracted. This weekend it was J.M. Coetzee’s The Childhood of Jesus, compulsively readable for the narrative (“the urgencies of how things will turn out,” as reviewer Peter Craven puts it) and the writing, so well-turned you hardly notice it except to know it’s produced by a master (twice Booker Prize winner and the winner of the Nobel Prize for Literature in 2003). And for the fact that it’s such an odd book, a puzzle, because there’s no character in the story named Jesus, the name is not even mentioned, but the book title hangs over the story while you read as if to confuse, explain, or tell a joke at your expense, and at the end of it, you’re not sure which it was. Maybe a dream. The Childhood of Jesus is the story of a man and a boy arriving in a new land, their past vague, the inhabitants of the new land washed clean of memory, though the man finds himself with the memory of memory, at least, and surprised at those who prefer goodwill over love/passion and do not “trade in irony.” The man’s main goal, however, is to find the boy’s mother. He believes he will know her when he sees her. Eventually he sees someone he believes is the one and persuades her to take on that role. The characters will not stay where we want them to be: the man faithful to the boy but foolish too, the mother he “intuits” unsuitable in many respects, the boy brilliant but bratty. The book abounds in philosophical discussions, and the man and boy argue over numbers and reading, the latter in connection with An Illustrated Children’s Don Quixote. Home from camping and back to internet connection and the distractible life, I scour online reviews of the book, reading what sense critics and reviewers are making of it. And that’s been fascinating too. This entry was posted in Books, Personal and tagged camping, Don Quixote, getting organized, J.M. 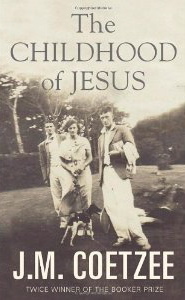 Coetzee, Peter Craven, photo books, The Childhood of Jesus by doradueck. Bookmark the permalink. I love your three cees, Dora–catch-up, camping, Coetzee! Although you enjoy escaping into the world of the intellect, one foot is also firmly planted in the practical day to day existence, struggling to organize your life and enjoying the pleasures of simple outdoor living. The book by Coetzee intrigues me.. . . Sounds like a fascinating read! Dora, thank you for “wrapping up” your summer the way you did! I can also very much resonate with your remarks about ‘catching up’ … Good for you for ‘scrapbooking’ to the end of 2012! (I continue to work on our trip and tour diaries.) And thanks for including the cover photos of your latest family albums. The most fascinating segment of your post for me this time were your words about J.M.Coetzee and his “The Childhood of Jesus.” I ended up taking the time to do some ‘catching up’ on this intriguing author and researching his new book. Thanks for sharing your reaction and for the prompt to read and reflect more. Thank you Hardy. I’m delighted that I sent you researching! If you ever read the book I’ll be interested to know what you think. i just love to read your musings. and right now so much of it is how i am looking at things. No disclaimer needed – it is all about the memories!.